They say you shouldn't look a gift horse in the mouth. I disagree. If the horse is a lemon, it's not gift at all. It's a big animal that you have to care for and feed and that's going to cost you lots of money for oats and a stable and such. As part of their Experience G promotion, Gatorade took me to a Raptors game. 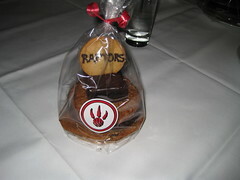 As part of the deal, I got an Raptors cookie bundle. 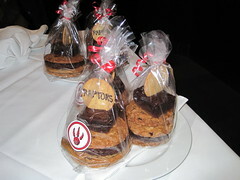 It's tough to explain exactly what a Raptors cookie bundle is, so here are a couple of pictures I took. I actually ended up taking home two bundles, one for each kid. They look amazing, don't they? There's a brownie in there, and several big cookies, and each bundle retails for $9 at the ACC. As a brownie and cookie aficionado, I was quite looking forward to cracking it open and diving in. They were so bad, even the kids couldn't eat them. How bad does a cookie have to be for a 5 year old to say no? I knew it was a weak bundle when even dunking the cookies in milk didn't improve things. Stay away from these cookies. They look great, but they're not edible. I'm going to the Raptors game next Sunday, thanks for giving me the heads up! haha. looks like you can light it on fire and set it in front of a front door. and from the way you described it, tastes that way too!